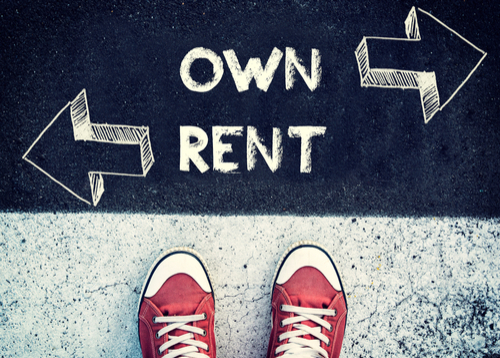 Whether it’s your first time on your own or you want to make the switch from renting an apartment to owning your own home, housing decisions can seem both exciting and intimidating. The best way to make your dreams come true is through research of your needs and understanding of where you stand with your budget and own future plans. After seeking out the neighborhood you want to live in or the size of the place you want for you or your family, your finances – and whether they limit your options – are the next things to consider. A home can be an excellent investment, given that property values are often on the rise. Within a number of years, the value of your home could increase by thousands over what you pay for it, and mortgages can be provided at a fixed rate so that your payments never change. In rental properties, companies can increase the amount of your monthly payments each time you negotiate a new lease. Owning property doesn’t inherently change your credit situation, but it may be seen as a way to invest your money toward a better future outcome. In home ownership, you’re investing in your future and possibly getting money back. That said, you’re also responsible for your own maintenance costs in home ownership. In rental properties, the landlord shoulders the costs incurred through repair and maintenance. It’s a good idea, prior to any sort of move, to save up. In addition to the costs of moving itself, apartment complexes and other rental properties often require two months of rent – first and last month’s – and a possible security deposit to cover any sort of damages. Also, you should plan for expenses like new furniture, homeowner’s or renter’s insurance. Lenders require a down payment of up to 20 percent of a home’s value, though some only require 3 percent down. Additional expenses when buying a home include any monthly housing association fees you may incur, the cost of home inspections prior to purchase and property taxes. In terms of monthly payments, whether renting or buying, it’s wise for your mortgage or rental costs to be the value of one to two weeks’ salary. Your credit score – determined by the three different credit agencies – will affect your options, though it is possible to secure loans through the federal government that are designed to encourage people with less-than-stellar credit to invest in their own home. If you intend to stay in one location for a while, owning your home is often a better option. You are secure in knowing that you have a roof over your head, that your bills shouldn’t vary wildly and that the neighborhood you choose is your hometown and safe place. Over time, property may build value based upon location and maintenance. Rents can fluctuate. Rental properties can be sold, forcing you to move. Or you might face limited choices based upon available vacancies when you decide to move. However, if you prefer flexibility and mobility, rental properties are easier to leave behind if you want to change cities or switch jobs. Depending upon your life and career goals, renting and owning provide you with different benefits and burdens. To help you better navigate your options in regard to these choices, CreditGUARD of America offers you a variety of credit counseling solutions. There are knowledgeable people available to help you review your finances, consolidate your debt and understand your current credit situation.